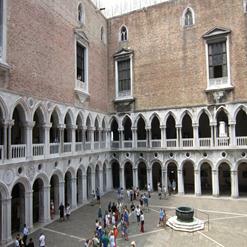 The Doge's Palace is a masterpiece of the Venetian Gothic architecture and one of the main landmarks of the city with an impressive structure composed of layers of building elements and ornamentation. Highlights include the Scala d'Oro, a lavish ceremonial staircase and the Sala del Maggior Consiglio, the Grand Council Chamber. The paintings on display include works of famous artists such as Tintoretto, Tiziano and Veronese.